"[T]he plot is relentless and the characters likable. . . . [A] classic adolescent journey. For teens already reading adult fantasy but wanting something a bit more on their level, this hits the spot perfectly." --Kirkus Reviews "I wouldn't be surprised if exciting new fantasy authors were one day compared to Ari Marmell." --Fantasy Book Critic "Marmell has a clever sense of humor." --SF Signal "Marmell's debut YA novel is a dark, brutal fantasy set in a complex and engaging world...Widdershins is an intriguing heroine, able to handle herself on the streets, though her naïveté shows at endearing moments. Readers seeking out a strong heroine in a well-crafted fantasy world will enjoy this title and look forward to the second." --School Library Journal "Widdershins is not your average heroine. Adept with her blade and her wits, sassy and sensitive, she should appeal to older teens both male and female." 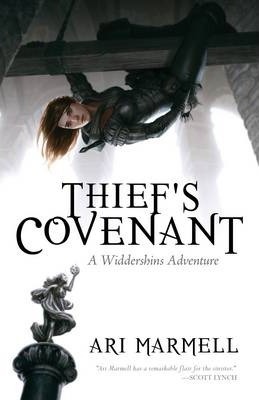 --RT Book Reviews, Three Stars (ENJOYABLE- Pleasant Read) "An interesting world is created in Thief's Convenant, with many twisting conflicts that converge into one. ...The setting is a very enjoyable city that every fantasy lover would embrace without a thought. All of the characters are lively, and everyone will love Olgun, Widdershin's personal god." Ari Marmell (Austin, TX) is a fantasy and horror writer and the author of several original novels including The Goblin Corps and three Widdershins adventures, Thief's Covenant, False Covenant, and Lost Covenant. He has also written gaming tie-in novels such as In Thunder Forged: Iron Kingdoms Chronicles (The Fall of Llael Book One) and worked as an author of role-playing game materials for games such as Dungeons & Dragons and the World of Darkness line. Although born in New York, Ari has lived the vast majority of his life in Texas--first Houston (where he earned a BA in creative writing at the University of Houston) and then Austin. He lives with his wife, George; their cat; and a variety of neuroses. Visit the Widdershins page at facebook.com/Madeleine.Valois, and visit Ari at mouseferatu.com, at facebook.com/pages/Ari-Mouseferatu-Marmell/181576062390, or on Twitter @mouseferatu.